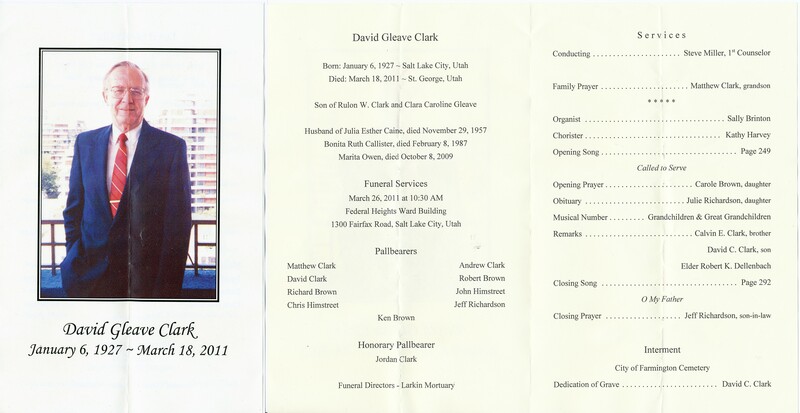 Weekend in Salt Lake City for the funeral of David Clark, who served as mission president during much of the time I was in Guatemala-El Salvador as a missionary. Click here to see the funeral program. Click here to see the obituary. Enjoyable time visiting with President Clark's now grown children. In fact, his son has already served as president of the Spain Madrid mission, the same mission where my parents served. Jack Freeman, my missionary companion for 4 months in Escuintla, was there and we had a great time catching up on the past 40+ years. He drove us to the cemetery in Farmington (a harrowing experience that had us laughing the rest of the afternoon.) Check out the pictures of Jack and I together in the cemetery and then check out the "old" picture from our Escuintla days. At the cemetery I was chatting with one of President Clark's daughters when a young woman asked me if I was the Thomas from Las Vegas who is the father of Josh and Rachel. Turns out she went to Bonanza and knew our family and even had a date or two with Josh apparently. She is married to President Clark's grandson. I think her maiden name was ? Graves. In another interesting coincidence, it turns out that President Clark's second wife, Bonita, is the aunt of Ron Reynold's wife, Christine. Ron is in my Rotary Club and they are in the El Camino ward in our stake. Apparently Christine was at the funeral but I didn't see her. President Clark lived in Las Vegas for a time after his mission practicing architecture and worked with another friend of mine, Jack Woodcock (a realtor who is also in my Rotary Club) on a project at the corner of Jones and Desert Inn called "Bonita Plaza" (Bonita was the name of President Clark's second wife, the one who was in Guatemala with him.) Click here to see a picture of Bonita Plaza. Barbara and Steve were the consummate hosts and I appreciated their hospitality, particularly letting me use their car on Saturday and then on Sunday when we went to the Tabernacle for "Music and the Spoken Word".